Strawberry Invest has teamed together with DIY Investor Magazine to provide our customers with access to a top resource for first time and DIY investors looking for helpful, interesting and educational articles to help them with investment funds. 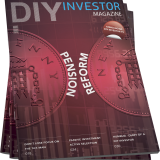 in addition to the quarterly magazines DIY Investor is now online with a great website; a great resource for news, tips and knowledge on all aspects of investment. Current Issue: The core theme of this issue is “trust”, something that’s in short supply these days. An important look at Defined Benefit pension transfers as valuations are at record highs. Also, with some of the top performing funds focused on India, the magazine looks reform and structural change in the country which could bring long term growth. Great section on “Focus on Funds” looking at fact sheets and how to pick a fund, crucial for first time investors getting at it alone! Issue 12:This issue focuses on making the most of your ISA allowance. Investigating AIM stocks for ISAs, differences between Lifetime ISAs and SIPPs. There is a great article of commodity investing via ETFs. Also, an important article examines investors ability to take risks and how that can shape a portfolio. Issue 11: Aside from including our (brilliant) outlook for investing in 2017, this issue of DIY investors looks to different aspects of 2017 and how investors can prepare for it. From handling inflation, to investing in a low interest rate environment, to the volatility sure to ensue in 2017. Also is a brilliantly helpful article on how to decipher ETF names. Issue 10: The issue looks at the Bats’ challenge to the incumbent FTSE index’s 30 year reign. In addition to this there is interesting articles on the lesser known asset class; the preference share. Plus there is an important article on keeping costs down in a portfolio as passive funds become increasingly popular. Issue 9: This issue focuses on the implications of the EU referendum and the Brexit result; this includes opinions from two large fund houses, Jupiter Asset Management and Henderson Global Investors. In addition to this there is an in-depth look into Investment Trusts and how they vary to Unit Trust and OEICS. Also the magazine looks at the different types of investment trusts, how to invest in them and their saving schemes.